Amidst all the concrete and neon of Seoul’s downtown, there is a small park on a hill from which rises, rather incongruously, a renaissance-styled white tower. This tower is all that’s left of the former Russian Legation, which was housing tsarist diplomats in 1896 when Korea’s King Gojong secretly fled there following the assassination of his mother at the neighboring Gyeongbokgung palace. Granted sanctuary, he ruled his kingdom from here for over a year until the situation had stabilized sufficiently for him to return to his palace with the new title of emperor. Following the extraordinary scenes at the 2018 inter-Korean Summit, and with stability on the Korean Peninsula now pending for the first time in decades, there will be many people in the Kremlin hoping that Korea can now return the historical favor and provide investment to a Russia struggling under an increasingly stringent international sanctions regime. On a recent visit to Seoul, I met with a number of clients from a range of different businesses and sectors: a government-owned investment bank; the trading arm of one of the giant chaebols, which continue to dominate the economy; a listed private sector entertainment company; and an international law firm. In conversation with these different actors, it quickly became clear that South Korean business struggles to reconcile two competing views of Russia: the historical legacy as successor state to the Soviet Union, and the great commercial opportunity it now offers. The two questions I was asked most frequently deal with the increasingly stringent sanctions regimes that the United States and Western partners have imposed on Russia since 2014 (Seoul has not adopted these or imposed any sanctions of its own, but remains concerned about becoming collateral damage); and with Russia’s interests in the Korean peninsula, in light of its historic track record supporting the North Korean regime but more nuanced recent approach signing up to limited sanctions following the nuclear tests and taking a back-seat in negotiations. Many South Korean businesspeople continue to view Russia with suspicion and struggle to separate contemporary Russia from the Soviet Union, the power that provided economic and materiel support to North Korea during the brutal 1950-1953 war and continued to prop up the Kim regime for several decades thereafter. This attitude may not be a characteristic unique to South Korea, but diplomatic relations between the two countries were only established in 1990 and the closeness of the ROK-U.S. relationship military relationship for the past half-century invariably means many in South Korea are influenced by the United States’ hostile attitude toward Russia. That said, the diplomatic and economic relationship between the countries has been on a clear upward trajectory; in addition to South Korea’s Moscow embassy, there are now a further six consulates across Russia (in Rostov-on-Don, St. Petersburg, Vladivostok, Yekaterinburg, and Yuzhno-Sakhalinsk) reflecting the communities of ethnic Koreans who have long been a feature of the region and representing one of the largest non-native populations across this multiethnic country. Many analysts point out that the two economies are complementary, with South Korea offering economic investment and advanced technology, and Russia providing natural resources and raw materials. The opportunity to participate in the creation of infrastructure in Russia’s underdeveloped and sparsely populated Far East region in and around Vladivostok is therefore a tempting, if risky, proposition. The costs associated with improving infrastructure could reach $67 billion, three-quarters of which will be spent on road and rail and will largely benefit South Korean businesses. In 2013 the Russian Direct Investment Fund (RDIF) and the Korean Investment Corporation (KIC), both government-controlled and directed investment initiatives, signed a joint memorandum to create a Russian-Korean Investment Platform, with the objective of facilitating cross-border investments of strategic interest to the two parties. Initially progress was slow, limited to dull but necessary actions such as air and sea links between the countries, trade fairs, and some light manufacturing. Cooperation was outpaced by investments the RDIF managed to secure from China and the Middle East, in particular, in counterpoint to Russia’s worsening relations with its Western partners after 2104. However, momentum has returned to the initiative with the election of President Moon Jae-in; he has adopted a new northern policy targeted at cooperation with Russia, and his presence at last September’s Eastern Economic Forum in Vladivostok so soon after his inauguration was intended as a sign of the value he attaches to developing the relationship. In his speech at the forum, he outlined his “Nine Bridges” program, referencing areas South Korea and Russia can focus on for immediate development: gas, rail, seaports, electricity, Arctic shipping, shipbuilding, job creation, agriculture, and fisheries. “The Russian Far East is where Russia’s New East Asia Policy and Korea’s New Northern Policy meet,” Moon announced. Moon’s interest is political as well as economic; creating strong commercial links between South Korea and Russia will also benefit North Korea, which lies between the two countries and whose willingness to participate will be an important factor driving success. Key among these, and of greatest strategic interest to the South Koreans, is the development of rail links to connect the isolated ‘island’ of South Korea to the greater Eurasian landmass. Prior to partition, there were two rail links connecting the southern half of the peninsula to the larger landmass: on the western side of the peninsula, the Seoul-Sinuiju link leading to the Korean/Chinese border, and on the eastern side the Busan-Wonsan link. It is this latter rail link, the Donghae Line, which is the real prize as it would be easy to extend onto Vladivostok. It would therefore link the world’s fifth largest port by cargo volume, Busan, to the world’s longest rail route, the Trans-Siberian, reducing transport time to key markets and lowering logistics and travel costs. What comes next? All eyes will be on the Trump-Kim summit which is scheduled for June, but aside from that there are plans for Presidents Putin and Moon to meet early in the summer, once Putin’s inauguration is over and the composition of the new administration has been confirmed. 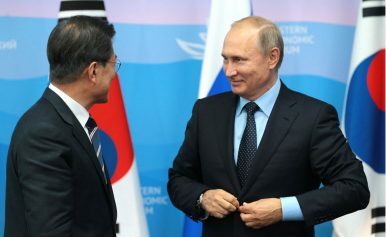 Both South Korea and Russia have agreed to work on a free trade agreement between Seoul and the Eurasian Economic Union, which would further boost cooperation between the parties. And in September, the fourth Eastern Economic Forum will be held in Vladivostok, at which both sides will be hoping to announce further significant investment commitments. To quote Moon again: “The combination of vast resources in the Russian Fast East and Korea’s advanced technologies will make the region a land of opportunity for the prosperity of Korea and Russia.” Any significant disruption to the blossoming inter-Korean rapprochement could delay or hamper these plans. But with the theme of regional prosperity high on the agenda in Putin’s fourth term, we can expect to see further progress in the South Korean-Russian economic partnership in the coming weeks and months. Timothy Stanley is Senior Partner for Russia/CIS at Control Risks, an independent global risk consultancy.